Pretzel (or Brezel) is another type of bread that’s baked in a particular shape and is very commonly found every where in Germany. It is a quick snack that can be picked up in any food kiosk, bakery, super market et al. Sometimes, they are also baked with Cheese on top. One can also get salted small pretzel crisps to snack in super markets. 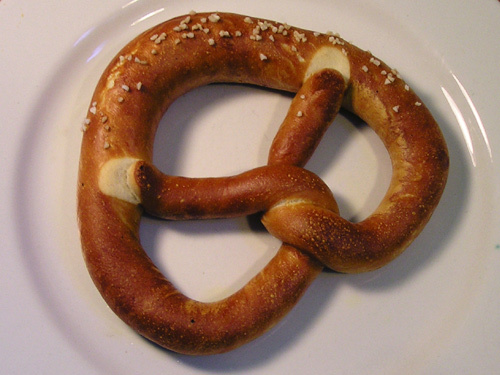 To add a bit more taste, one can eat Pretzel with Sweet Mustard preparation.